Hey!!! It's Thi again back from the All Access trip to Spectacle Island. I had a lot of fun flying the new kites with Ibrahim, Alice, Senait, Ross and David Coffin. 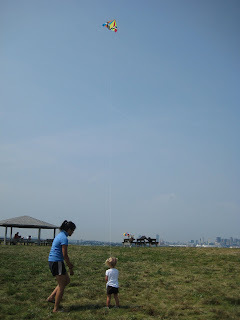 A little girl and her brother came up to me and Alice while I was trying for 5 or so minutes to get a kite up into the sky. 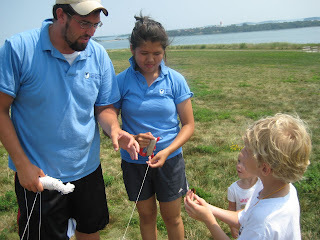 I gave her the string and before I knew it, it was flying so high. Time flew by so quickly that when got back to the beach, we had to leave in 20 minutes. I quickly ran down to the beach and got myself soaking wet with the salty water. David was already in the water and soon Ross and Alice joined us. On the boat going back to the Bank Of America Pavilion, we heard thunder. As I got of the boat, it started to POUR. I shared an umbrella with someone who had come onto the trip with us, as the minutes ticked by, it started to rain harder so I decided to make a run for it back to the SH/SB Office. This is my last time at All Access and I'm really sad and I can't wait until next year!